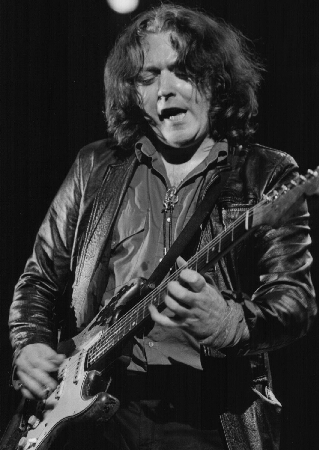 Irish blues-rocker Rory Gallagher hasn't visited these shores in five years -- an eternity by American standards. His name may not ring automatic bells, but he's had a legendary career. His band Taste opened the American tour of Blind Faith (the Eric Clapton/Steve Winwood supergroup) in 1969. He also toured with John Mayall and Cream, plus did Muddy Waters' "London Sessions" and other sessions with Jerry Lee Lewis, Albert King and the Rolling Stones. "I've been working a lot in Europe and recording over there. But it's time to come back and build up the following again in America," says Gallagher, who headlines the Paradise tonight. "I was sick last year with a virus infection, and even heard a rumor that I was dead," he adds. "It's funny how quickly some people forget you." But fans have come out of the woodwork to see Gallagher on his long-awaited return. One fan was Slash, the Guns N' Roses guitarist who jumped on stage at Gallagher's recent Los Angeles show and jammed on Chuck Berry's "Nadine." "I liked Slash. He's a nice guy and can really play," says Gallagher. "We rocked out." The 42-year-old Gallagher, who has toured under his own name for years, has made 14 albums of electric blues, cut with some slide guitar and some country-blues, especially on his new album, "Fresh Evidence," on the IRS label. "I tried to make it a rootsy blues album," he says. "I wanted to touch on styles that went back to the '50s, before the superstar blues of Albert and B. B. King. A lot of the electrified country blues of that early period, by Son House and Tampa Red, gets overlooked. It's very rhythmic and very raw. And that's what I went after on songs like `Ghost Blues' and `Heaven's Gate,' a tormented kind of blues in the tradition of Robert Johnson's `Hellhound on My Trail.' "
The "Fresh Evidence" album also sounds rootsy, because Gallagher insisted on using original studio techniques. "I used old forms of echo and old tube compressors. A lot of new sound decks just make things sound synthetic and tinny. I like a nice rumble on bass, openness on guitar and drums that breathe." The album is typical of Gallagher's refusal to sell out. "I've never commercialized my music. I've seen that ruin too many people who think two-minute ditties are the answer." One thing for sure: The Paradise will be rumbling tonight: In person, Gallagher hits overdrive. "Playing live is my natural element. It's too hard to relax in the studio because there are too many options. It's just not as exciting." The photo was sent to me by Bob Hewitt ( author a couple of the articles on RoryON! !